When I first started my blog back in 2008 I believe it was, I had the intention of doing more "show and tell" of the collections I have and of things that I like. I've done a FEW of those types of posts, but not many. I decided that this week, it was time that I dedicated a post to a subset of one of my favorite THINGS in the world, antique ribbon work. Today, I want to share my collection of powder and rouge boxes. 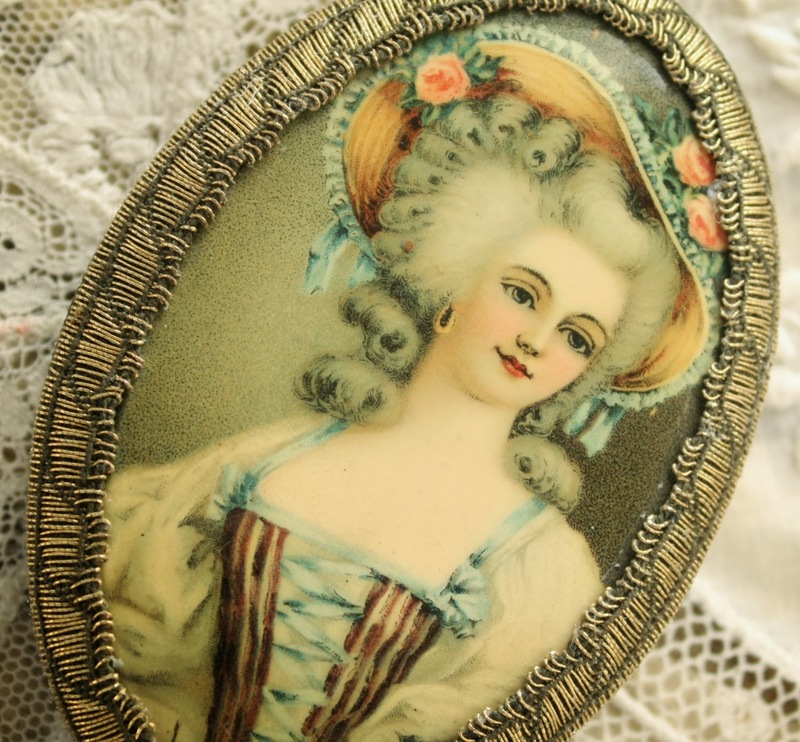 No fabulous ribbon work pieces are easy to find, but these little treasures do seem to be around a bit more often than others, presumably because they were small and easy to display on a vanity table for a little dose of pretty and they were also useful as they held cosmetics. For these reasons, I presume, we do occasionally come across some of these lovelies. Never enough, but some. 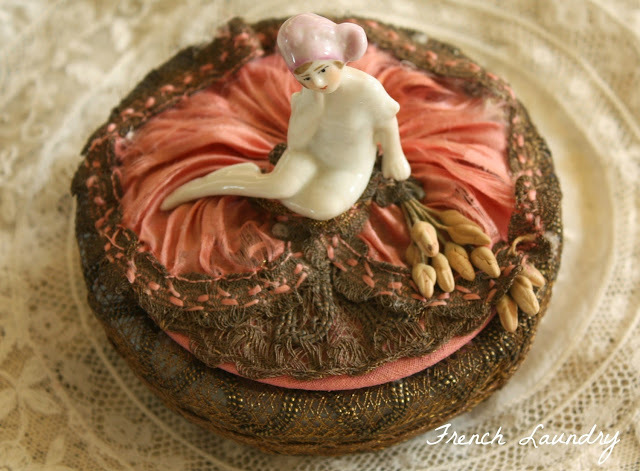 (SMILE) The piece at the top of the post is actually a glass powder box that has been covered in fabric and metallic lace as well as a beautiful seated porcelain figure. These glass bases are a bit more rare and this is the only one like it that I have. She is a bit tatty, but considering her age, she is still pretty darn fine. 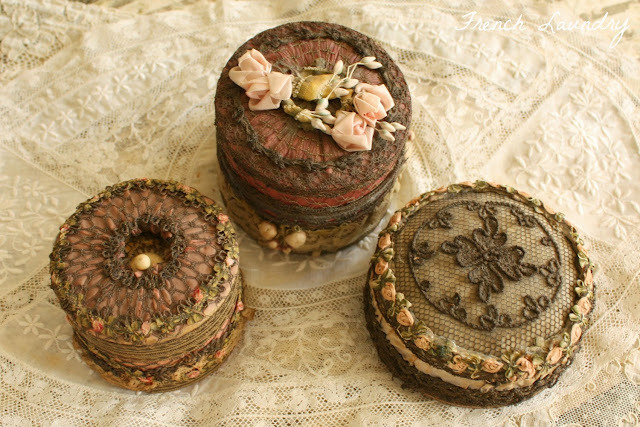 More commonly, these boxes are cardboard that has been covered in fabric and metallic net and then the beautiful silk ribbon flowers which in all but the tiny one at the bottom in the picture above were little lengths of rosettes that were purchased by the yard just like you would have purchased lace or other embellishments. I have know people who have managed to find cards of this rosette trim which was never used. I have turned appropriately green with envy and then purchased a yard or two from them for much money. This no doubt made us both happy. 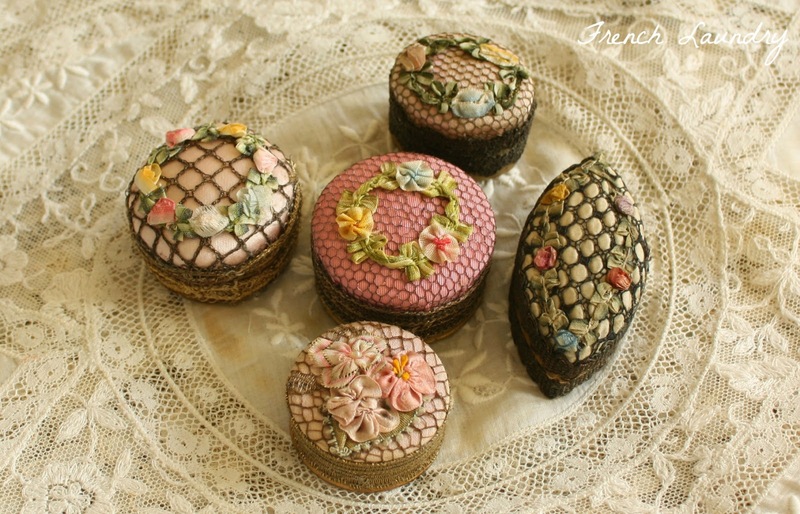 This little quintet of boxes are all small with the large one in the middle being just about 1 3/4 inches in diameter. 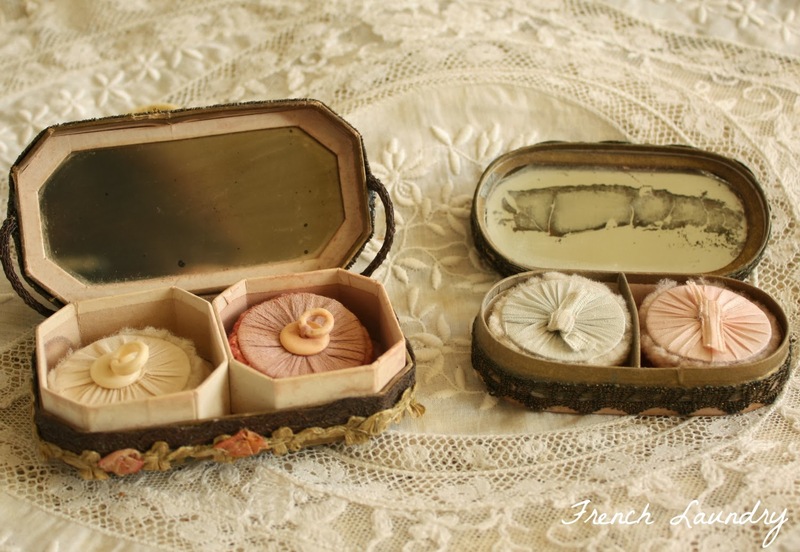 The marquis shaped one is a very unusual size and I am not sure what it was used for but the others are rouge boxes (we call it "blush" or "blusher" these days) with the exception of the largest one-it is a small powder box. I know this because when open, it has a mirror in the lid and a cake of face powder is still in it. The one on the left has a cake of red rouge and a well used puff. I have a couple of powder boxes done in this fashion. Still cardboard underneath, but a short box, sometimes only tall enough for a puff. In the case of the one above and the one below, the puff is attached to the lid. Neither one has the metallic trim, but they make generous use of silk or rayon ribbon to create the ruffles. I love the heavily eyelashed face on the bottom one! Below are three which I would consider large pieces. The one at the top stands a good 3 inches tall. Each has a powder puff inside made of swansdown. These pieces are difficult to find and when you do, you will pay a handsome sum for them but if these are your THING, you will find a way to make them yours, just as I did because there is something about them that just makes your heart sing. 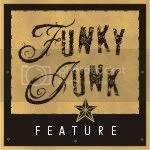 Below is piece that is rare as hen's teeth. 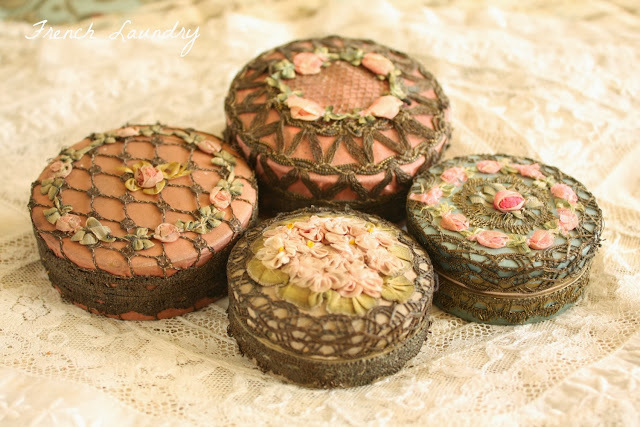 It is a triple powder box which sort of reminds me of a wedding cake. 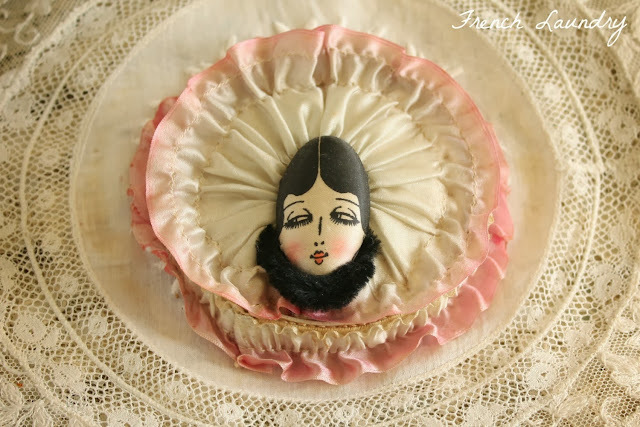 The top section holds a powder cake and a puff, the center a rouge cake, and in the bottom, and large powder puff. It is an exceptional piece and will, as they say, have to be pried from my cold dead hands. Hopefully not anytime soon! These are a few more of the powder boxes in the middle size range. They are really pretty, especially the one closest to the camera as it has a bouquet of little silk flowers on the top rather than just the rosette trim. 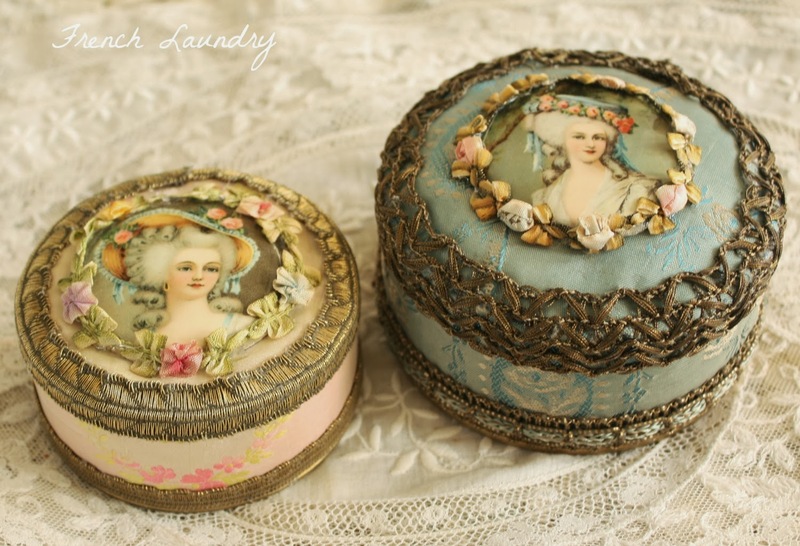 In the more unusual category are these double powder boxes below. The one on the left has a little strap. 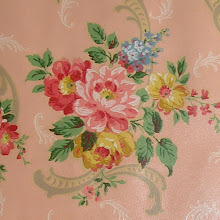 Could have been carried by milady or perhaps just hung on the wall by the vanity. Again, these are far more rare and the ribbon work on the tops is particularly lovely. These each have a mirror in the top and their little powder puffs-one for rouge, one for face powder. This larger beauty may have been for talcum powder. It is still super full of loose powder which I keep saying I'm going to toss every time I open it and get a nose full of 90 year old powder, but the fact that it has survived this long has kept me from doing so thus far. 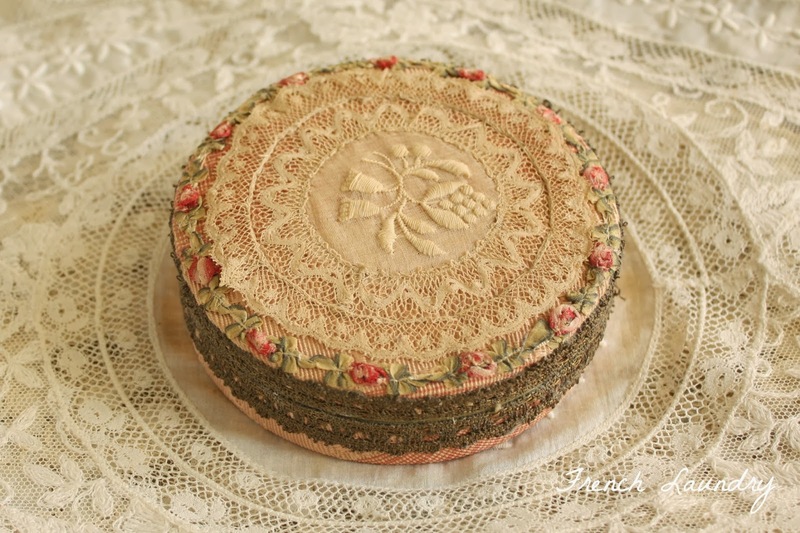 This one is special because its condition is excellent and due to the fact that it is topped with a very lovely piece of French Normandy lace which is not the norm. Finally, I wanted to share with you my own take on fancy powder boxes. 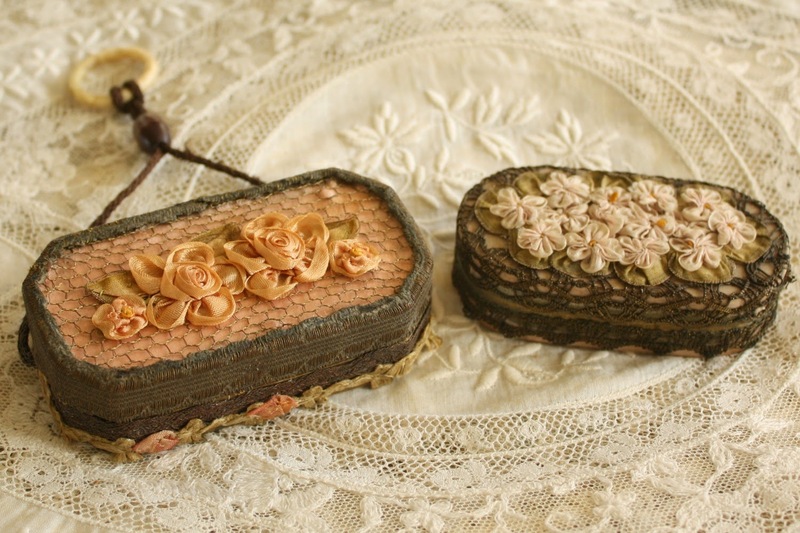 These 3 have been lovingly created by me from vintage powder boxes and all antique materials. I sold one very similar to the one on the left in my Etsy shop The French Laundry this last year and just recently made one for myself. The blue one was originally for sale, but when she got taken for a test drive in my bedroom with the other girls...well, let's just say she begged to stay, at least for a little while. 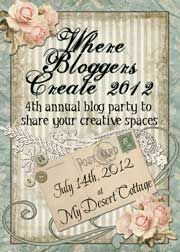 As I have stated before, it is an occupational hazard when you deal in and create things that you love. Sometimes, they just don't make it to the shop. The last one did though. 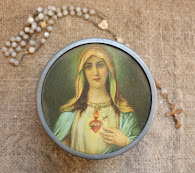 She's a beautiful oval shape (very unusual for a powder box). 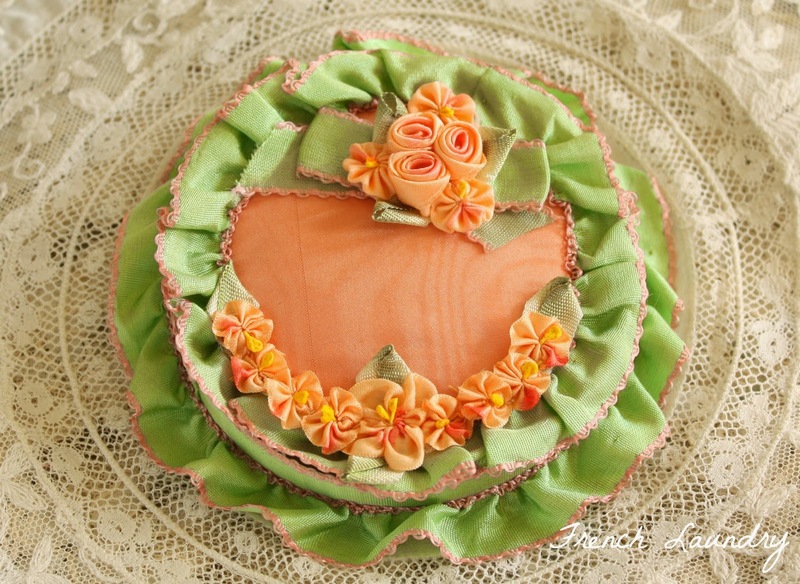 If you love antique ribbon work, I highly recommend the book "The Artful Ribbon" by Candace Kling. 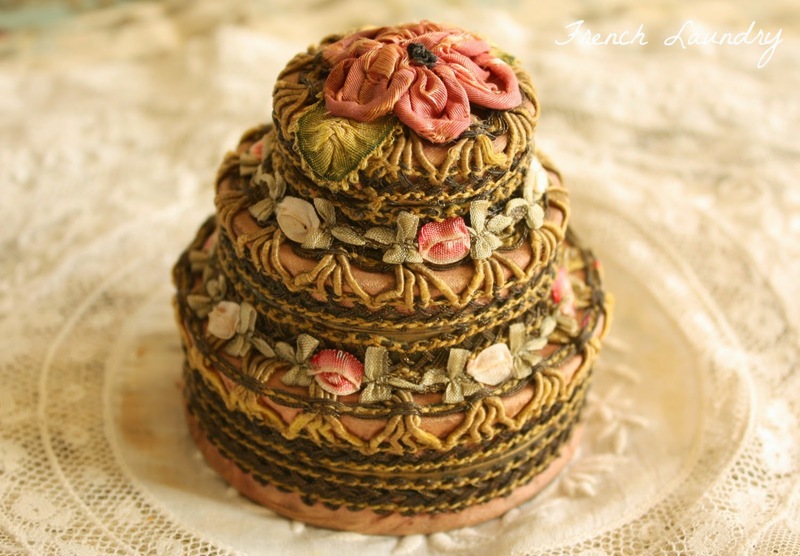 She not only shares techniques on how to create your own flowers from ribbon, but it has lots of great historical information as well as pictures from private collections that are utterly breathtaking. In the meantime, I hope you have enjoyed your little visit to my part of Blogland and I hope to see you again sometime. P.S. I have some price reductions in my shop, so you might want to take a peek when you have a chance. I can't believe that a year has gone by since I first opened my Etsy shop, The French Laundry, but as of January 6, it will be a full year. It was a great 2013 and I am looking forward to bringing you more beautiful treasures in 2014. I'm still trying to find my way around balancing shopkeeping and working full time, but it is getting a bit easier. I'm challenging myself to get more organized and stop hoarding (well, maybe just cut back on the hoarding :-) I am, after all, a collector myself ). I also have a few small home projects/purchases to do this year, so the income from the shop becomes even more important. With all of that in mind, I'd like to offer a little "Happy Birthday" gift to you in honor of my first year in business. 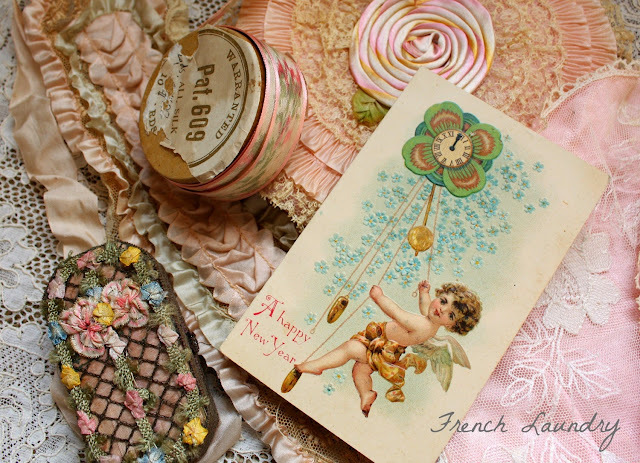 Just stop by The French Laundry from now until midnight tomorrow (1/6/14) and enter HAPPYBIRTHDAY20 at checkout to receive 20% off on all purchases over $20. Now that Christmas is over, it is a good time for you to pick up that special something you've been wanting for yourself at a special price.